In this part of the tutorial you will get familiar with the following items. 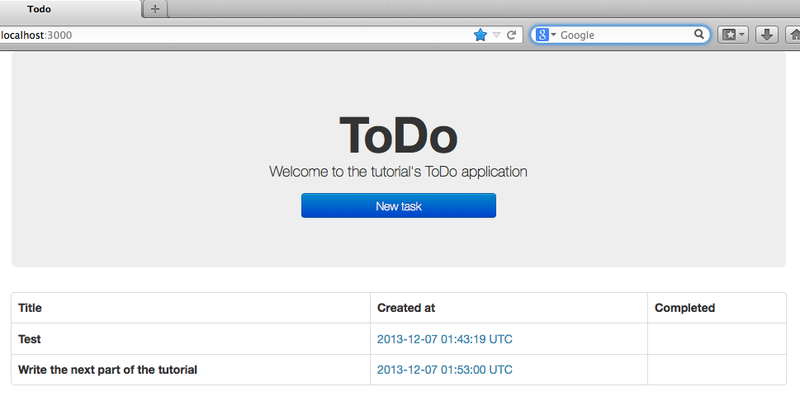 Open the newly created directory todo with your favourite text editor (I use Sublime). adding a # at the beginning of the line (we won’t use this gem for now). From your browser navigate to localhost:3000. Are we OK? As you can see, the application has already been configured to use the SQLite database engine for persistence. This is ok for now but on an upcoming tutorial we are going to change this file in order to use MySQL. db/migrate/xxxxxxxxxxxxxxxxx_create_tasks.rb This is the migration. Migrations are files which change your database’s schema upon execution. This specific file has the appropriate commands that will create the table for our tasks. View the contents to get an idea of the commands. app/models/task.rb This is the model. 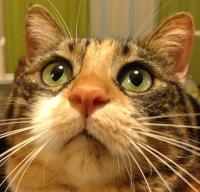 Models are classes defining persistent objects. This specific file defines our task model. If you open the file you will see that is actually an empty subclass of the ActiveRecord::Base. We are going to add stuff there later on. 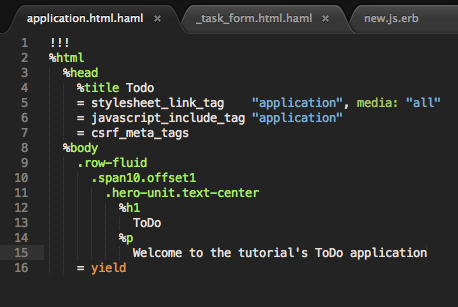 At this point we are going to get familiar with the rails console - your best friend while developing rails applications. I suggest opening a new window/tab of the console application you’re using (I use iTerm2) so that you can have access to both the rails console and the shell prompt of our application’s root folder. I have a third one for the rails server command. Imagine the rails console as an application in which you can directly execute your ruby code having all your application’s files available (and some of them already loaded). Don’t be scared by the example, read here. Hmmm.. Refresh your browser (at http:://localhost:3000). That’s right. We generated the model migration but we didn’t ask to apply it so that our database schema gets updated. 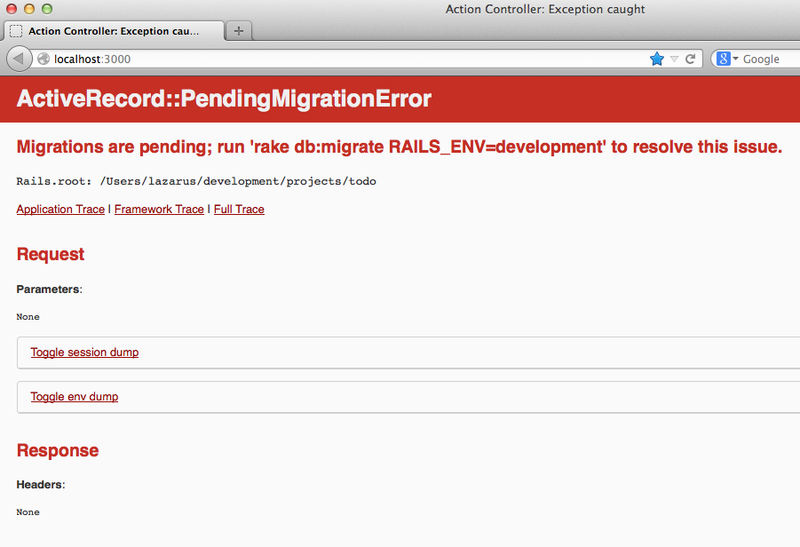 Note: you may skip the RAILS_ENV=development part since this is the default. Great. The table has been created. 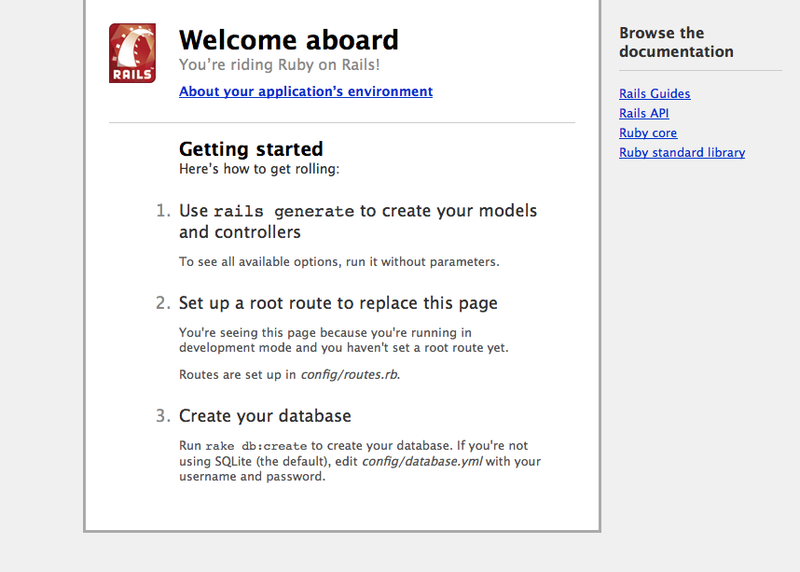 If you refresh your browser you’ll see the default rails application page again. Since our Task class is empty, what are all these properties? Where did they come from? Well, ActiveRecord scans our table and automatically maps the column names to our model’s attributes. Cool? Cool. As you may notice, there are two attributes there that we didn’t ask for: created_at and updated_at There were added automatically by our model generation command and ActiveRecord automatically assigns values to these columns upon creation & updates of a model. Cool? Cool. That’s it. You just saved your first task. Now will load it in order to edit/update it and then to delete it. We loaded our task by selecting the first and only record of the Task model. Confirm that we have no tasks anymore. Ok, our model seems to be working fine. Time to start giving a face to our application. The default views of a rails application are erb files that in the case of an html page you can imagine them as jsps but instead of Java you write ruby code. We already have such a file in our application, application.html.erb, open it in your text editor to view its contents (it’s located under app/views/layouts). This file is a layout meaning that you may use it to display content that you wish to be present to a lot (if not to all) of your application’s pages. Each page you create will be embedded at line 11. You may add whatever you want before & after the yield directive. As you can see, the file contains both static and dynamic content (enclosed in <%= %> tags) and looks very much like a jsp page. We are going to change this now by using haml. Why? Because our views will look clearer and more beautiful. It will be easier to read and update them. As you can see we also removed the turbolink related stuff. IMPORTANT: Make sure to set your text editor to use 2 spaces instead of tabs!!! Got it? Isn’t it simpler? You’ll see more haml code below that will help you understand it better but you may follow a simple tutorial later. Create the corresponding (empty) home page file home.html.haml under app/views/pages directory. Refreshing your browser, you should now view an empty page (since our home.html.haml is empty). But if you view the source of the page from your browser, you’ll see the html of our layout. Let’s edit our layout to add some cool “bootstrapish” stuff. 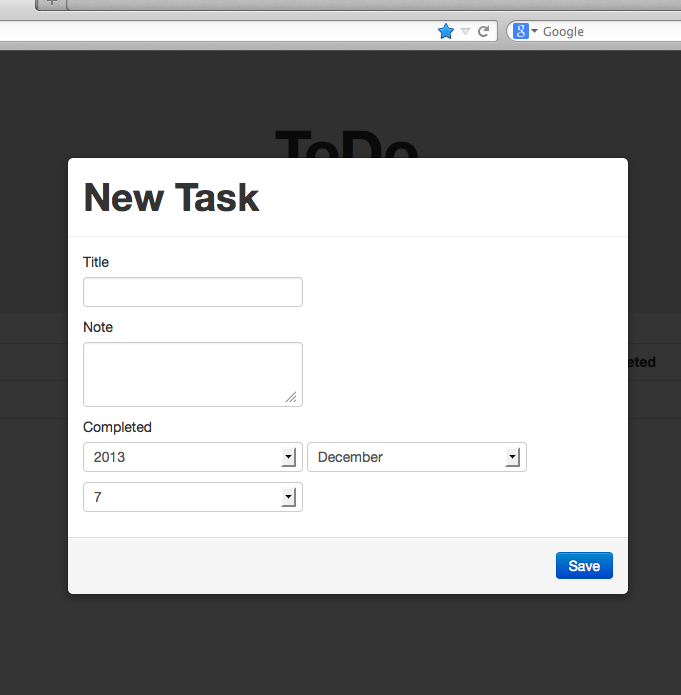 Time to add some task functionality. 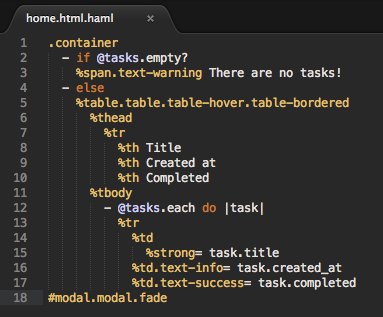 %span.text-warning There are no tasks! We created our pages controller in order to handle the static pages of the application. The “static” word here doesn’t mean static content but actions that do not belong in the context of a resource. This controller is described as a non-resourceful controller. On the other hand, now, we need to create a controller for managing our model(resource) Task. We want this controller to handle actions (view, create, new, update & destroy) on our model. This kind of controllers is described as resourceful. 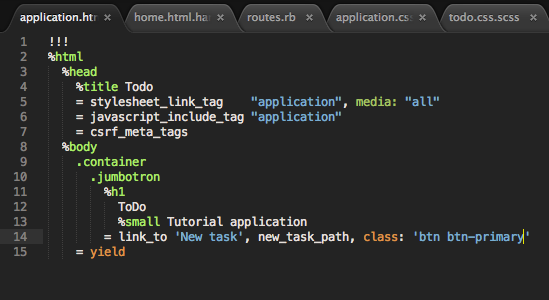 As you can see, a bunch of new routes have been created besides our root one. Notice the forth column of them. These are the actions that are mapped because of the addition of the resources method in routes.rb. We actually want all of them except the index since we are going to display our task index in the home page instead of a separate one. It’s pretty clear what the others are supposed to do. So, let’s remove the index action. 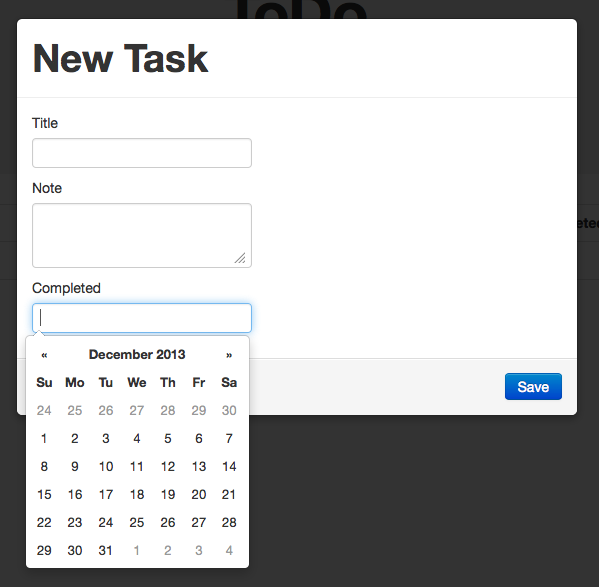 We created the tasks controller (app/controllers/tasks_controller.rb). We will correct the code above later but for the time being, let’s see how does the modal appear in our page. If you press the button now, you will see a modal with the word Foo as its content. Before continuing, you should know what a partial is: a re-usable part of code (imagine it as a part of a view) which you may embed into other partials/pages/layouts etc. So, if we have a part of a view that we want to use to other places too, we usually create a partial. As you can see, simple_form picked to render the title as a simple input text, note as a textarea and, well, the completed date field as a combination of three selects. Let’s change the last one because it doesn’t look nice. Edit application.css.scss which is under app/assets/stylesheets and add the following before line *= require_tree . Here we defined the create action that creates the task and then redirects to the root path aka our home page. We also created the task_params private method so that we filter the params of the request in case someone tries to pass parameters that we don’t expect. We only allow values for the title, note and completed attributes of our model. There will be cases that your model will have attributes you don’t want to be set by the user and this is the way to control them.